April 12, 2017 – The Daniel K. Inouye Solar Telescope (DKIST), currently under construction on Haleakala, Maui, is expected to start observing the Sun in 2020. When it does, it will rely on two complex infrared instruments being built by the University of Hawaii Institute for Astronomy (IfA). Their goal is to measure the Sun’s weak magnetic field. The first of these to be completed is called the Cryogenic Near-Infrared Spectropolarimeter (CryoNIRSP). 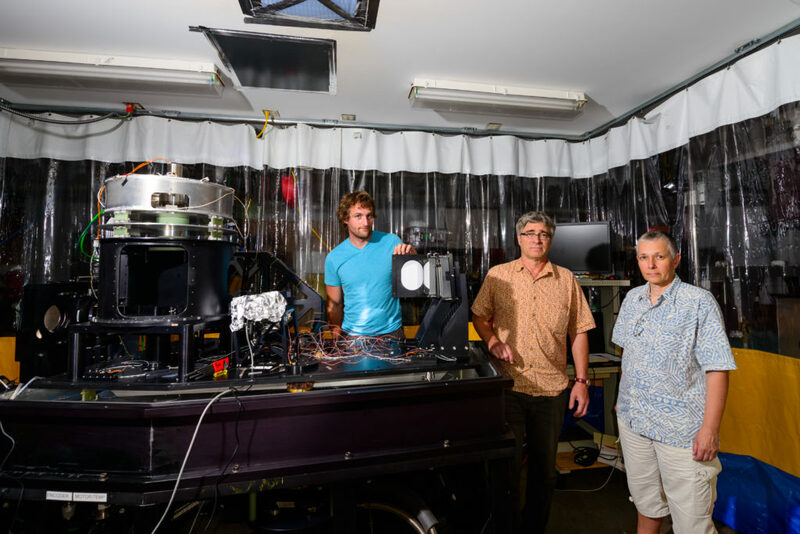 In a major milestone, it took its first look at the Sun from the laboratories at the IfA’s Advanced Technology Research Center on Maui. The instrument design was lead by Dr. Don Mickey, now retired from the IfA. Monitoring space weather is crucial as our society increasingly relies on technology that is susceptible to damage from these large space events. Scientists have successfully measured the solar magnetic field strength close to the Sun’s surface, where the field is relatively strong. Higher in the solar atmosphere, in a layer called the corona, the magnetic field weakens to the strength of a refrigerator magnet. DKIST will be able to detect this weak field and usher in a new era of solar physics. The DKIST Data Center will be located in Boulder, Colorado, where data will be shipped via optical fiber directly from Hawaii.